This material is based upon work supported by the U.S. National Science Foundation (NSF). The Human-Environment Regional Observatory (HERO) program is a unique undergraduate-graduate-faculty experience that engages in research on human-environment relationships in Massachusetts. HERO Fellows conduct hands-on research under the mentorship of Clark University faculty. The research conducted by HERO Fellows often leads to scholarly publications, presentations at academic conferences across the USA, and awards and honors. This eight-week curriculum is sponsored by Clark University O'Connor Fund. HERO Fellows analyze the causes and consequences of global environmental changes at local scales in faculty-led research projects. Each Fellow is paired with a Clark faculty mentor and other researchers on the HERO team. Fellows will learn how to use various research methods such as GIS, remote sensing, geostatistical modeling, interviews and focus groups. HERO students watching DCR tree planting in Chelsea, MA. May 2017. The theme of HERO 2018-2019 is Greening the Gateway Cities where we extended our previous analysis of juvenile tree health and stewardship from Worcester to two Massachusetts Gateway Cities: Chicopee and Fall River. This tree inventory and stakeholder assessment built upon last year’s research conducted in Chelsea, Revere and Holyoke in collaboration with the Department of Conservation and Recreation. We are joined this year by six Clark undergraduate students from a variety of departments and programs. "Clark HERO Fellows work to green Massachusetts' Gateway Cities"
The theme of HERO 2017-2018 was Greening the Gateway Cities, where HERO fellows extended previous analysis of juvenile tree health and stewardship from Worcester to three Massachusetts Gateway Cities: Chelsea, Revere and Holyoke. This particular research focus is expected to be a multiyear effort. This tree inventory and stakeholder assessment complements the previous several years of research conducted in Worcester in collaboration with the Department of Conservation and Recreation, and the Worcester Tree Initiative. "HERO tree-restoration efforts takes root in Massachusetts' gateway cities"
"Clark students share secrets of tree survival after beetle scourge"
During Summer 2016, HERO focused on a continued analysis of tree survivor-ship, looking at trees planted by the Worcester Tree Initiative (WTI) and the Department of Conservation and Recreation (DCR), including street trees; tree inventory and mapping mixed with surveys and interviews; and dynamics of the tree planting programs and stewardship. These particular focus areas have incorporated research skills such as tree surveying and GIS/RS analysis, social research (e.g. interviews or focus groups), and qualitative data analysis. "College Town: Satellite imagery tracks tree growth in Clark study"
"'There is no syllabus for this'"
"Clark students track survival rate of trees planted after beetle scourge in Worcester"
"After beetles and bulldozers, new urban forest emerges in Holden"
"New crop of ‘HERO’ researchers to help protect Worcester’s trees"
This research stream uses field data collection, geoinformatics-based mapping and ecosystem services modeling/forecasting techniques to examine how the extensive tree replanting program has impacted the urban environment in terms of forest diversity, cover/density/configuration, land surface temperature, and various ecosystem services, and the likely future impacts. The TPA research stream will contribute to a burgeoning body of knowledge concerning urban forest sustainability, tree planting from an environmental justice perspective, and ecosystem service modelling. TPA will also shed new light on the current and future eco-services impact of tree planting initiatives throughout the U.S. This research stream uses qualitative data collection methods, such as interviews and focus groups to explore: (1) How the experience of tree planting programs and the associated policy interventions, affects neighborhood-level urban ecological vulnerabilities, environmental awareness and sense of place? ; and (2) How can resource managers and policy makers implement more environmentally aware policies and build local tree and environmental stewardship? We emphasize the interactions among individual residents, policy makers at a variety of jurisdictional scales, and biophysical processes. The PMA group seeks to better understand the social and political element of tree survivorship. Examining the ongoing policy changes to the Worcester region’s urban forest during the tree planting efforts provides an opportunity to observe changing urban forest management protocols, and their impacts on ways people experience their city, town or home, i.e. place-making, and how their ethic of tree and other environmental care changes based on those experiences. Students in the HERO summer program presented their findings on July 30, 2015. Coverage of the tree replanting efforts in Worcester post-ALB infestation were the topics of this year's summer study. 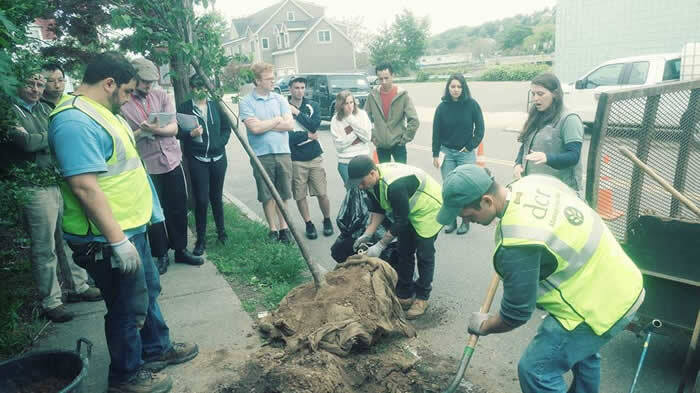 Students assessed the health of the tree replanting initiative conducted by Mass DCR and WTI (Worcester Tree Initiative) to replace trees the USDA APHIS (Animal Plant Health Inspection Service) had to removed to eradicate the beetle. As part of their study these students went into the field conducting interviews with neighbors and other Stakeholders as well as surveying the health of the newly planted trees and how to continue to care for them. In the fall, HERO Students will present their research to the office of the USDA APHIS in Massachusetts; at Fall Fest, an on campus university wide research presentation program; and in the spring will travel to San Fransisco for the American Association of Geographers Annual meeting. Students in the HERO summer program presented their findings on July 31, 2014. Coverage of the Asian Longhorned Beetle Stakeholder summit included members of the HERO summer REU Site program students, faculty and staff alongside members of the Stakeholders from the local neighborhood residents, city, state officials who have been active in the ALB issue. "Asian Longhorned Beetle is downfall of summer in central Mass." (NECN: Mike Cronin) – "One of the downfalls of summer in central Massachusetts is the Asian Longhorned Beetle. It’s been five years since the pest first surfaced in the area. Since then, tens of thousands of trees have been chopped down because of the infestation. One of the hardest hit communities, the town of Shrewsbury, is now taking action to figure out the best way to deal with the problem." The Asian longhorn beetle infestation in Central Massachusetts continues to be studied by the HERO REU Site Summer 2014 program. This program is a continuation of a 3-year NSF grant from May 2012-April 2015. This material is based upon work supported by the US National Science Foundation (NSF) Current Active Grant Nos.SBE-1156935. Past HERO funded grants with continued research beyond that of the HERO Program: BCS-0948984, BCS-0709685, OCE-1058747, EF-1065741, SES-0849985, SES-0951366 and through the PIE, ULTRA-EX, CNH, MACRO-BIO, DCDC II and FCE groups of the LTER. Material is also based upon work supported by US Dept of Commerce (NOAA SARP) Grant No. NA09OAR4310141. Any opinions, findings and conclusions or recommendations expressed in this material do not necessarily reflect the views of the NSF. 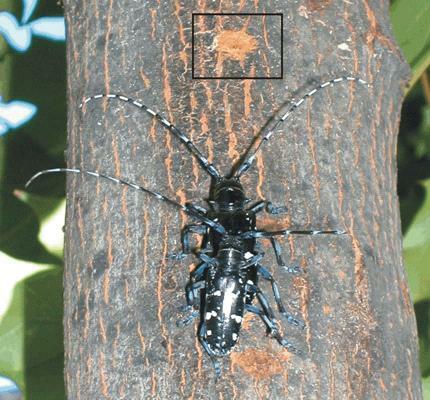 April 2012: Clark HERO receives NSF $329,992 grant for Asian Longhorn Beetle Infestion in Worcester Area.